Julia Child, Simone Beck and Louisette Bertholle. This isn’t just any cookery book. 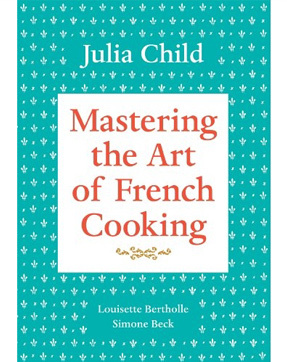 It is Mastering the Art of French Cooking, first published in 1961, it is not for the feint of heart. Julia Child revolutionised cooking in the US and this was the cookbook that launched her career. Despite being a classic, it is not going to be the right book for everyone. It has some very complex recipes inside and it is also not particularly good for vegetarians due to the high amount of dishes that require meat. Having said that, it does feature some amazing recipes and some lovely cakes and desserts that should please just about anyone.